Last night at Knitting Factory, Larkin was just a singer, albeit a special one. The Sunday night crowd was larger than expected for an early post-holiday off-night, and Larkin entertained us with stories and songs anchored by her deeply rich voice. The band included the legendary producer Tony Visconti (Bowie, TRex, Morrissey) on bass guitar. 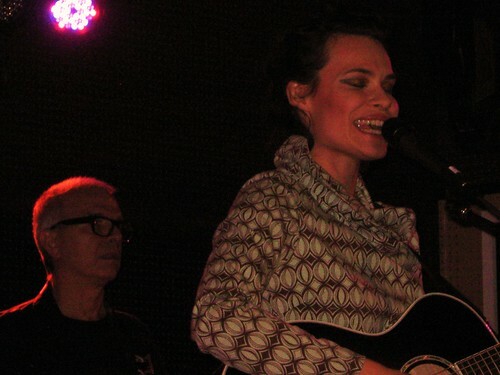 Larkin performed primarily new songs, and just one number from her most recent release Parplar. We recorded this set with the four-microphone rig set up directly in front of the soundboard, and other than some venue sounds during quieter moments of the recording, the sound quality is quite excellent. Enjoy! 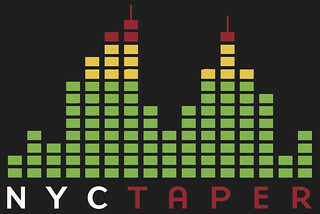 If you email nyctaper for access to this recording, we expect that you will PLEASE SUPPORT Larkin Grimm, visit her website, visit her MySpace page, and purchase her latest CD Parplar directly from the Young God Records website [here]. Thank you for putting all the effort in to record this gig. Thanks! Such a joy hearing these new songs. Very, very good. Can’t wait for a new studio album!